Work has started on one of the largest habitat restoration schemes ever seen in Cornwall. 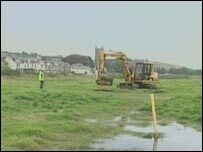 An area the size of nearly 25 football pitches near Wadebridge is being flooded to help bring back species such as the otter and the kingfisher. The project on the River Camel is costing about £100,000, and most of the work will be completed within weeks. Four channels will be dug through flood defences and drains widened in the area which is already a wildlife haven. The flood defences have been in place for about 150 years to protect prime agricultural land from flooding caused by the river. Under the scheme - which is being funded by the Department for Environment, Food and Rural Affairs - four landowners will be compensated for 20 years for the loss of the land. Once the area is opened up and seawater comes though the flood-banks for the first time in more than a century, the land will revert to saltmarsh and mudflats. Passers-by on the nearby Camel Trail will soon notice the differences soon, but the area will not be opened up to the public straight away because of the sensitive nature of the new habitat.